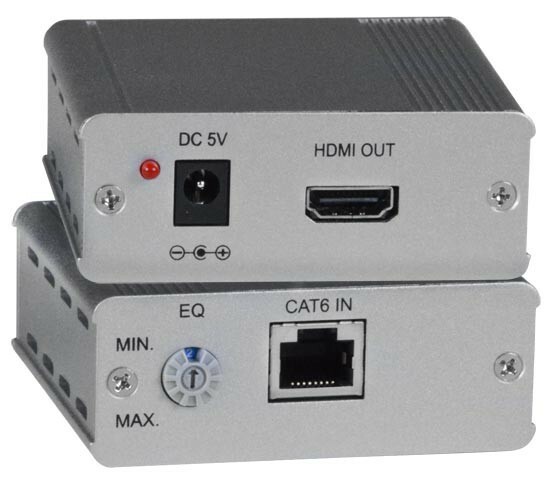 The VOPEX® Low Cost HDMI Splitter/Extender simultaneously distributes digital video and audio signals from one HDMI video source to up to eight displays, each located up to 150 feet away using a single CAT6 UTP cable. Also known as: HDMI splitter extender CAT6, multiple HDMI monitors, digital HDMI video distribution over CAT6, monitor splitter, share video, split HDMI video, hub. The VOPEX system consists of two components: the HDMI broadcast unit, which connects to the host video source, and a remote unit for each remote display. Transmits an HDMI signal over one CAT6 cable up to 8 displays. Supports HDTV resolutions up to 1080p and computer resolutions up to 1920x1200. With 8-bit color, extend to 150 feet. With 12-bit color, extend to 50 feet. Compliant with HDMI and HDCP 1.1 standards. 3D (includes LED indicator when broadcasting 3D media). Select between 8-bit or 12-bit color. Eight female RJ45 ports for video extension; one to each remote unit. 150 feet (46 meters) over CAT6 cable (23 AWG). CAT6 UTP solid 23AWG 550 MHz or better cable with TIA/EIA-568B wiring terminated with standard RJ45 connectors is recommended for 1080p applications (not included). Extension distances will vary with the resolution and quality of the cable used. 100 or 240 VAC at 50 or 60 Hz via AC adapter. One female HDMI-A port for display. One female RJ45 port for receiving high definition video/audio signals and DDC signal. Never connect the VOPEX-C6HD-8LC or ST-C6HD-R-150LC to an Ethernet card, Ethernet router, hub or switch or other Ethernet RJ45 connector of an Ethernet device. Damage to devices connected to the Ethernet may result. Warning! Never connect the VOPEX-C6HD-8LC or ST-C6HD-R-150LC to an Ethernet card, Ethernet router, hub or switch or other Ethernet RJ45 connector of an Ethernet device. Damage to devices connected to the Ethernet may result.